"Magritte: The Mystery of the Ordinary, 1926–1938"
Photograph courtesy of the Art Institute of ChicagoRen&eacute; Magritte (Belgian, 1898&ndash;1967). 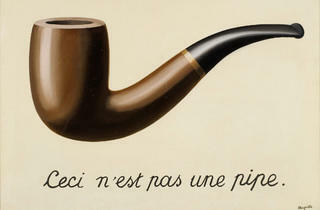 The Treachery of Images (La Trahison des images), 1929. Photograph courtesy of the Art Institute of ChicagoRen&eacute; Magritte (Belgian, 1898&ndash;1967). The False Mirror (Le Faux Miroir), 1928. 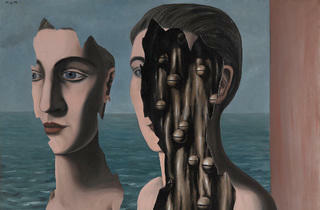 Photograph courtesy of the Art Institute of ChicagoRen&eacute; Magritte (Belgian, 1898&ndash;1967). Illumination (L&rsquo;illumination), 1937. 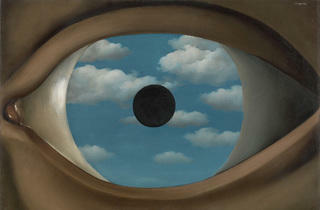 Photograph courtesy of the Art Institute of ChicagoRen&eacute; Magritte (Belgian, 1898&ndash;1967). The Meaning of Night (Le Sens de la nuit), 1927. Photograph courtesy of the Art Institute of ChicagoRen&eacute; Magritte (Belgian, 1898&ndash;1967). The Menaced Assassin (L'Assassin menac&eacute;), 1927. 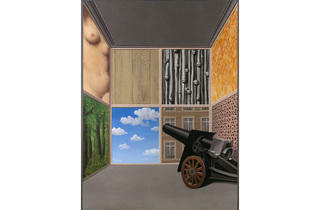 Photograph courtesy of the Art Institute of ChicagoRen&eacute; Magritte (Belgian, 1898&ndash;1967). 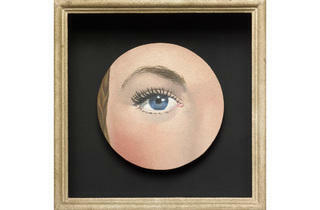 Painted Object: Eye (Objet peint: &OElig;il), 1932/35. 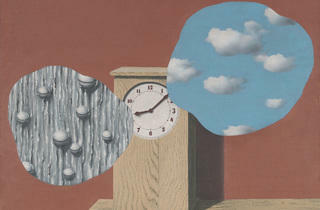 Photograph courtesy of the Art Institute of ChicagoRen&eacute; Magritte (Belgian, 1898&ndash;1967). The Secret Double (Le Double secret), 1927. 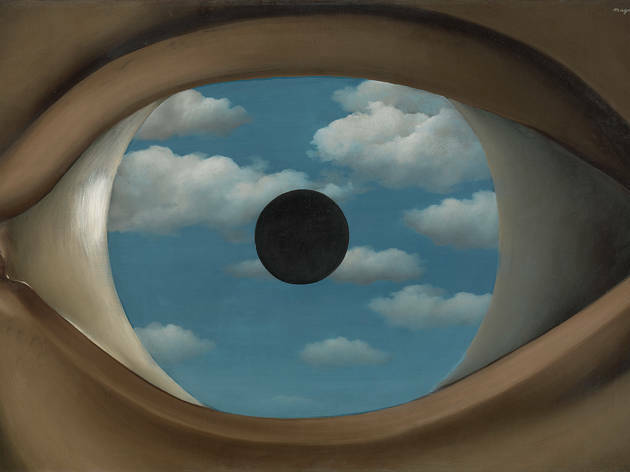 Photograph courtesy of the Art Institute of ChicagoRen&eacute; Magritte (Belgian, 1898&ndash;1967). 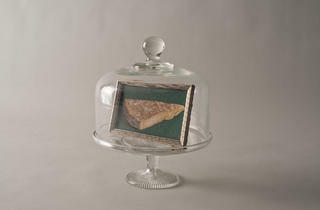 This Is a Piece of Cheese (Ce&ccedil;i est un morceau de fromage), 1936 or 1937. Photograph courtesy of the Art Institute of ChicagoRen&eacute; Magritte (Belgian, 1898&ndash;1967). On the Threshold of Liberty (Au seuil de la libert&eacute;), 1937. 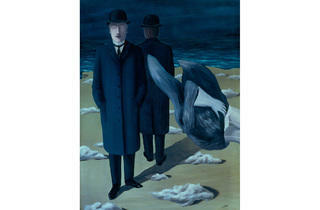 Photograph courtesy of the Art Institute of ChicagoRen&eacute; Magritte (Belgian, 1898&ndash;1967). The White Race (La Race blanche), 1937. When I walk through an exhibit devoted to one artist, I wonder, would that artist have enjoyed the presentation? As I ambled through the Art Institute’s somber and dark Magritte: The Mystery of the Ordinary, 1926–1938, with its paintings set on charcoal walls beneath pools of yellow light, I guessed that Rembrandt would have gotten off on it, but not Magritte. 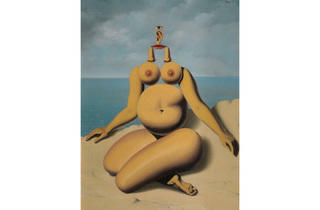 When one thinks of Rene Magritte, images of blue skies and green apples likely come to mind. 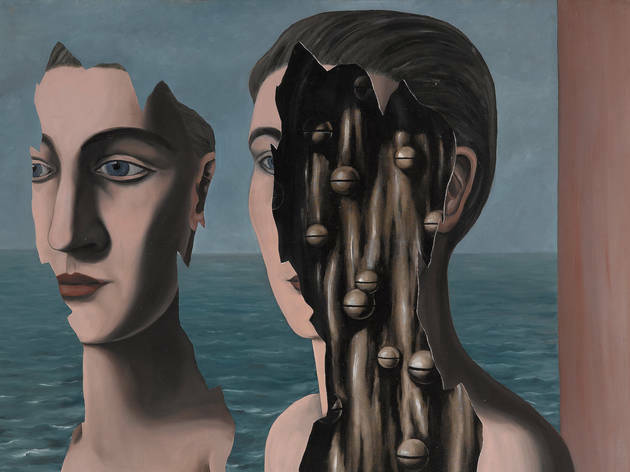 The surrealist's work was crisp and clean—only the scenes presented were painfully bizarre. 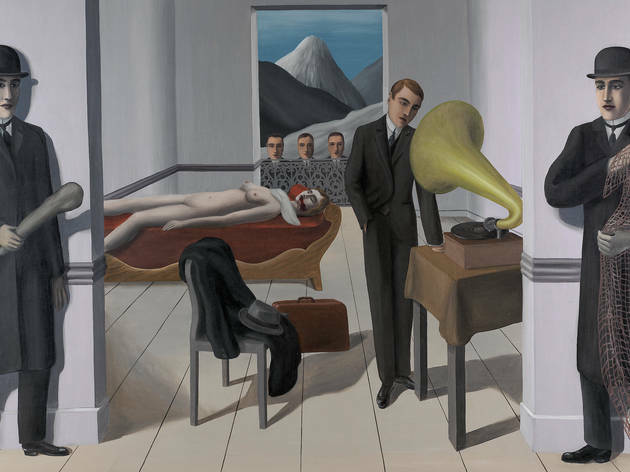 These iconic Magritte paintings are mostly his later works, and you’ll only find them on magnets and plates in the gift shop. The Art Institute's showcase of his formative years is akin to being trapped under a bowler hat (which of course are for sale as well), and while there’s little to critique in terms of Magritte’s work itself, there are two questions to answer when you're seeing a show of works by an artist of this caliber: 1. 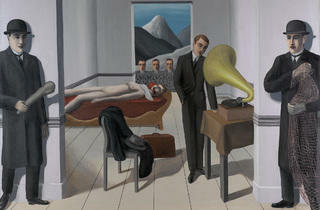 Does the show tell us anything new about Magritte’s work? Yes, particularly if all you know are those apple images. And 2. Is it an enjoyable show to go see? It is not, due to a bevy of strange curatorial choices at the Art Institute. 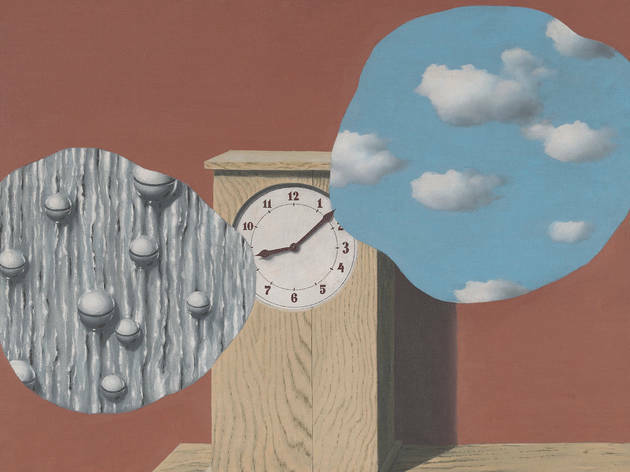 The 100+ work show, which first ran at the Museum of Modern Art in New York and the Menil Collection in Houston, focuses on the dozen years in which Magritte began to explore the themes and aesthetics that would define his career. The show moves chronologically, and the Belgian's earliest work on display, which you first encounter after an incongruously placed Napoleon funeral mask, is more stereotypically surrealist, grotesque. Dismembered body parts dance in gardens made of children's toys. 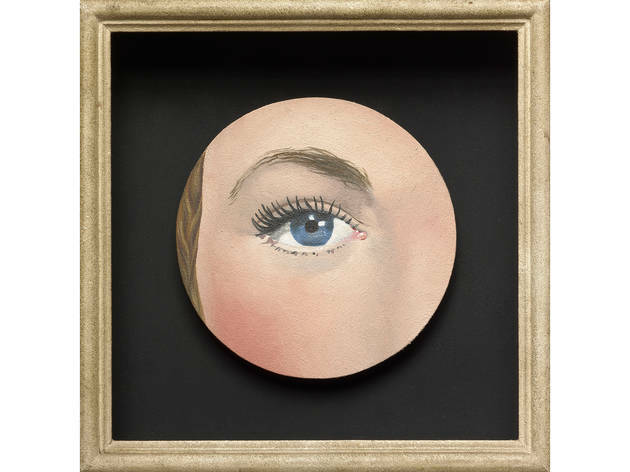 With a fleshy, lavender palette, Magritte seems to have painted these pieces from a Revlon compact. The art becomes brighter and wittier as we move to his Paris years, a period when he met many famous French surrealists, like Dali, though the exhibit remains dim as a Finnish funeral parlor. 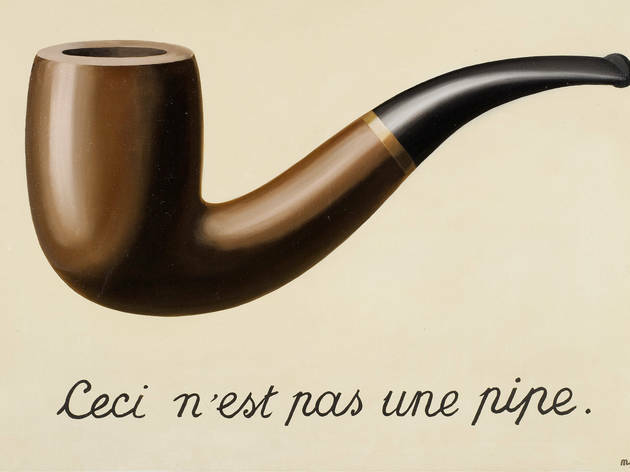 Magritte begins playing with words—and what handwriting!—by adding them to paintings of contradictory objects, which culminates in The Treachery of Images, that iconic pipe. As the gallery follows him back to Belgium three years later, we are forced to zig zag through a oddly arranged hallway, with one painting placed on forward facing walls like lined-up dominos, which forces the viewer to consider just the single painting at a time. It’s clear what the curator is getting at, but it’s also jarring and distracting. The gallery leads to a large room filled with fascinating ephemera, again oddly served up, in wooden shipping crates. 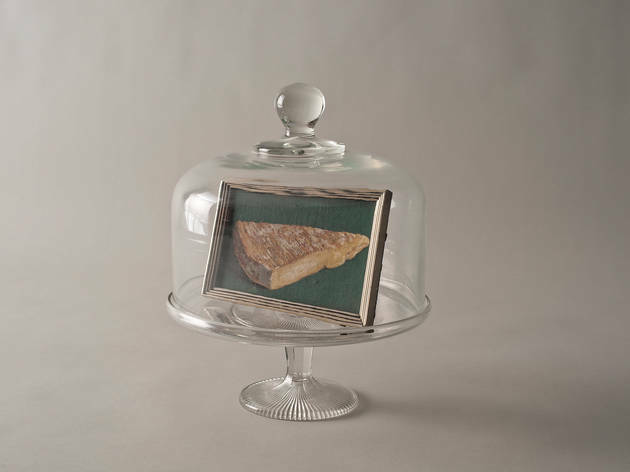 The commercial work (like restaurant ads) and photographs offer insight into the Magritte's personal life and brain, if a little too late. It would have been nice to see this material mixed in with his canvases for context, particularly when it directly relates to a painting found earlier in the show. Similarly, there’s mention of his Surrealist contemporaries, but we see none of their work.